You will never truly know a person until they open up to you and what they dealt with in their past. 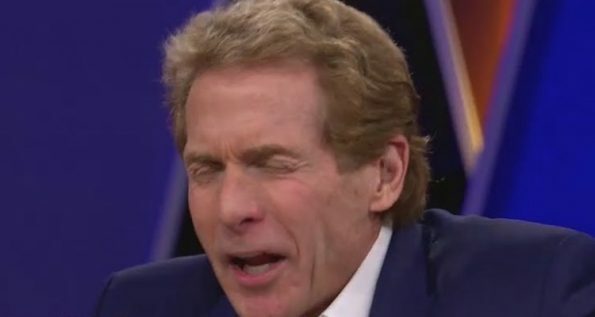 On the outside looking in, Skip Bayless looks like a guy who you might think grew up with a silver spoon in his mouth and never faced any real adversity. My father’s abuse didn’t stop with the emotional or verbal variety. He did a lot of his own heavy lifting at the Hickory House, and in my childhood, before the alcohol began to weaken and shrink him, he was a black-haired, bad-tempered, muscled-up 5-foot-9 by maybe 180 pounds. When he got mad, which was often, he hit me in the face with his open right hand, always making sure he caught me in the cheek or lip or eye with his wedding ring, which would leave a bruise or welt or a little taste of blood. Freud would’ve had a field day with that. I put up with this until I was maybe 14, when one night I told him if he ever hit me again, I was going to hit back. He knew I meant it. I was big for my age. That was the end of the wedding-ring wounds. He was nothing but a coward of a bully. From age 7 or 8 until I left home for good at 18, I spent just about every Friday and Saturday night at some friend’s house, just to stay away from my father. I didn’t even have to tell my mother where I was. Not once did a friend ever spend the night at my house. Not once. I had no curfew or ground rules. Skip goes on to say how he eventually would stand up to his dad. He soon moved out and took up with a woman who lived down the street, a friend of my mother’s. They eventually moved to Tulsa, tried to open another hole-in-the-wall barbecue place and lived in a trailer park. My father eventually drank himself to death at age 49. The official cause: cirrhosis of the liver. According to Bayless, his mom battled alcoholism as well, but actually had enough of it to the point she got up and went to Alcoholics Anonymous and faced her addiction head-on. Unlike my father, my mother had the backbone to take on and beat her demon. That, and the desire to live. My mother quit drinking cold turkey, never missed a Monday-night AA meeting and stayed sober the rest of her life. My mother humbled herself into someone I barely knew. My mother openly and constantly referred to herself as a recovering alcoholic, said she had a disease and warned she would always be one drink from oblivion. My mother remarried happily. My mother became a leader in AA. My mother channeled her addictive behavior into, of all things … golf! She took up the game at age 50 and won her club championship several times. My mother was something. Much of her is in me. Skip has done well for himself since being in the spotlight, having signed a massive, $22 million deal with a $4 million signing bonus with Fox Sports in 2015.